Of all the Tom and Jerry dvds we have reviewed this one is by far my favorite. Partially because this is not a collection of short episodes of Tom and Jerry its a full length film about the crazy cat and mouse pair. 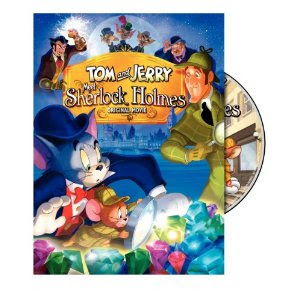 Tom and Jerry Meet Sherlock Holmes puts Tom and Jerry in the middle of a diamond heist in London. Not at all their usual setting in a home. Actually Tom and Jerry are hired to investigate along with the famous Sherlock Holmes and Dr Watson. The problem is like all Tom and Jerry episodes, Tom and Jerry can barely stop fighting and teasing each other long enough to actually concentrate on the case. In the end its sort of a clue style who did it sort of adventure and I can honestly say even non Tom and Jerry fans will really love this one. Connor will usually not sit and watch episode based dvds over and over again but he routinely requests this one along with his other movies he watches at bedtime. I think we both agree its our favorite Tom and Jerry yet. Tom and Jerry Meet Sherlock Holmes is available right now and you can pick up your copy on Amazon ! Disclosure: We were given a copy of Tom and Jerry Meet Sherlock Holmes free of charge, we were not compensated for this post in any other way. My opinions and comments on items we review are always my own and are never influenced by sponsors.